In a multi-channel workflow, the same story is used in multiple Publication Channels. However, each Publication Channel has its own rules and restrictions, such as text formatting, writing style (especially headlines), article length (restricted for print, 'unlimited' for Web), image quality (low for Web, high for print), and so on. As a result, a story that is published for one Publication Channel cannot be directly used for another Publication Channel (think of Web versus print). However, much of the content of a story that is used in one Publication Channel can very well be used as a basis for creating the story for use in another Publication Channel. For this purpose, such content can be imported when creating a new article in Content Station. Once the article is created, additional article components and high-resolution images are added as needed, the title is re-written in the style for the print publication and the length of the body text is adjusted to ensure copy fit. The content of the Web story is un-touched. The creation of a new article is based on an article template. In order to import specific content from a particular story, text variables are added to the article template: one for each story component (such as the story title, the intro component, the body component and so on). The definition of the text variable controls which component of the story is imported into the component of the article. Typically this is the content of a related component (the body text of the Web story is imported into the body text of the print article), but it is also possible to combine multiple components during import, for example by importing the 'header' and 'body' components into a single 'body' component. Step 1. In InDesign, open a layout that is stored in Enterprise and create a text frame for each article component that the article should contain. Step 2. 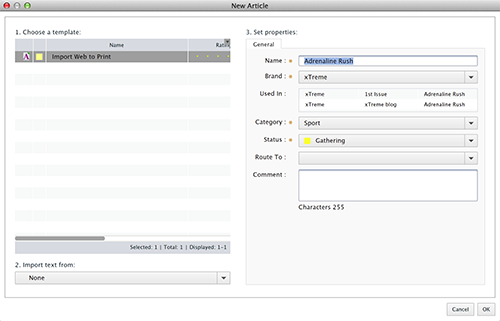 For each article component, create a text variable of type Custom Text that defines the content to import (see below). Step 2a. 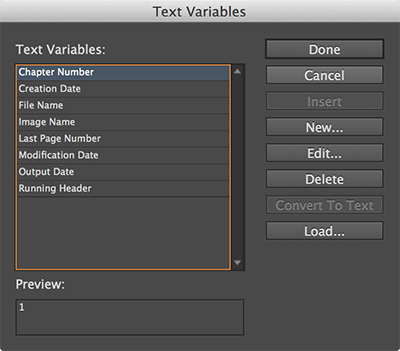 In InDesign, choose Type > Text Variables > Define... . The Text Variables dialog appears. The New Text Variable dialog box appears. Step 2c. In the Name box, type a descriptive name. Step 2d. From the Type list, choose Custom Text. Step 2e. In the Text box, enter the definition (see below). Step 2f. Click OK and Done to close the dialog boxes. Step 3. Insert each created text variable in the correct text frame. Place the text cursor in each frame and choose Type > Insert Text Variable > [name of your text variable]. Step 4. Turn the text frames into an article template. 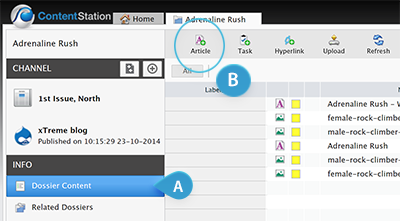 Select all text frames, choose Smart Connection > Create Article and save the article as an article template by selecting the Save as Template check box. Note: Make sure to use a descriptive name for the article template: the Content Station user needs to choose the template from a list; it therefore needs to be clear which template to choose. The rule that defines which content to import is stored in a text variable. In this method, the component that holds the content to import is directly referenced by its name. Note: This syntax is only used when the article component is imported from a Publication Channel of type 'Print' or 'Adobe DPS'. 3. The text frame is turned into an article template. In this method, regular expressions are used. For each component for which the expression is true, the content is imported. This regular expression looks for all components of a Publish Form of which the display name contains the word 'body' (not case sensitive). Note that the content of the original fields have now been combined into one article component. Comments: This regular expression finds all components containing the word 'body' in their display name. This search is not case sensitive. Comments: This regular expression finds all components containing the word 'body' followed by a set of numbers in their display name. This search pattern is also case sensitive. Comments: This regular expression finds all components in a source article that are labeled as 'crosshead'. This search is case insensitive. For more information about regular expressions, visit www.regular-expressions.info. To test your own regular expressions, visit www.regexr.com. By default, InDesign text variables do not break across lines. During the import therefore, the text variable is converted to regular text. If multiple article components are found they are all imported, separated by a paragraph break. Step 1. Open a Dossier. The New Article dialog box appears. Note: This template is set up by your system administrator. It controls which content is imported from the story and which content is ignored. When you are unsure which article template to use, check with your system administrator. 2. Choose the story from which you want to import content by choosing the Publication Channel in the 'Import text from' list. 3. Set the properties for the article as needed. The article is created. Logical next steps are to modify the imported content and to add additional content such as article components and images. Paragraph styles. The first paragraph of the imported text is styled based on the paragraph style that was assigned to the frame in InDesign. 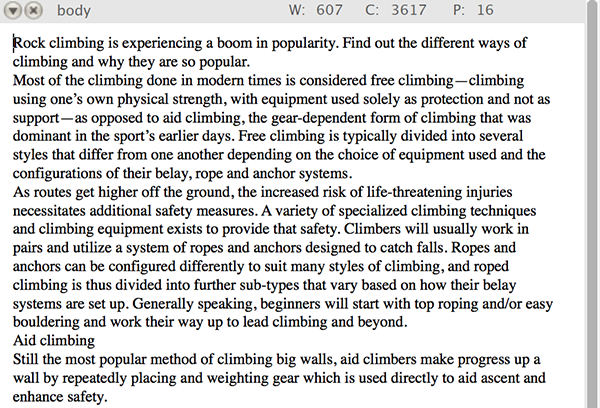 Any remaining paragraphs will be styled according to the next paragraph style definition as defined for the paragraph styles in the article template. Character styles. When the imported article contains text that is styled with a character style that is also available in the article template, the character style is applied. When the imported article contains text that is styled with a character style that is not available in the article template, the character style is removed and the text is styled by using the character style as defined in the article template. 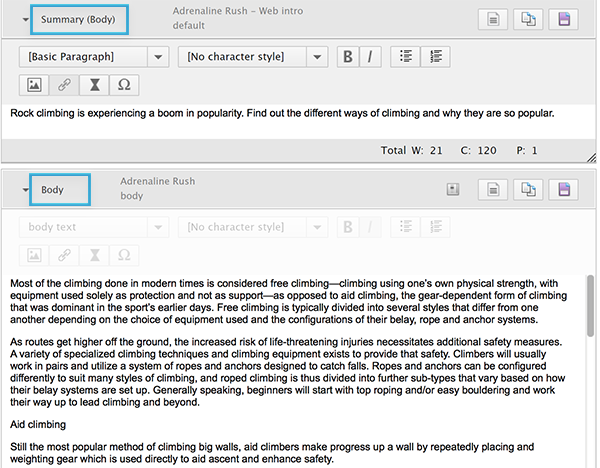 Local style overrides (such as making text bold or italic or changing the font size are maintained. In this example, the article template consists of a single paragraph that starts with some text, directly followed by a text variable (that is going to be replaced by the source content), directly followed by some text. The source consists of a single paragraph of text. The result is one long paragraph of text. The source consists of two paragraphs of text. The result is two paragraphs of text, split by the paragraph break of the source content. In this example, the article template consists of 2 paragraphs of text. The first paragraph starts with some text, directly followed by a text variable (that is going to be replaced by the source content), directly followed by some text. The source consists of 4 paragraphs of text. The result is 5 paragraphs of text of which the first 4 are styled based on the paragraph style containing the 'next' style.